Simple color coding on Chips bags separates the flavors easily for the consumer to make his purchase. Brother Kane has wisely gone for that approach. Strangely, three of their six main range flavors have very similar colors - This is one of them. Aside from that oddity, the Hot Sauce bag is very well designed. The company logo is large, but the curved design works. The 'Fresh From Our Family Farm' slogan adds to the background image of a a family farm. While these standard thickness Chips had a crunch, it was a snappy type of crunch rather than a crisp or hard biting crunch. A few at a time and the crunching munch takes effect, but nothing notable. The Chips had a slight orange tinge to them. Thinly and evenly spread, but sufficient enough to provide a fairly good coating of seasoning throughout the bag. 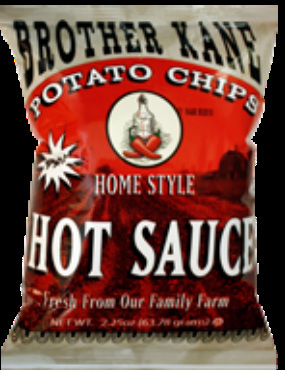 There were not as many broken or cracked Chips as we found in Brother Kane's Crinkle Cut varieties, but there could have been a few more whole and hearty Chips. There are hot sauce stores, hot sauce fairs and too many to count peppers, used in the myriad of different flavor hot sauces available to the consumer. This flavor is therefore cleverly ambiguous. Steak tastes like steak, these Chips could taste like anything and they can happily be labelled Hot Sauce. It includes an almost salty, vinegary background to an aroma and taste of standard hot sauce. A pretty mild version of it, but you would certainly describe it as Hot Sauce. A mere taste description doesn't really answer the question the bag poses however. It is not nearly the hottest Chip, nor is it the tastiest Chip. If there was such a thing, it is a run of the mill Hot Sauce Chip.